Introduction: p53 protein is a product of p53 gene, which is now classified as a tumor suppressor gene. The gene is a frequent target for mutation, being seen as a common step in the pathogenesis of many human cancers. Proliferating cell nuclear antigen (PCNA) is an auxiliary protein of DNA polymerase delta and plays a critical role in initiation of cell proliferation. Aim: The aim of this study is to assess and compare the expression of p53 and PCNA in lining epithelium of odontogenic keratocyst (OKC) and periapical cyst (PA). Materials and Methods: A total of 20 cases comprising 10 OKC and 10 PA were included in retrospective study. 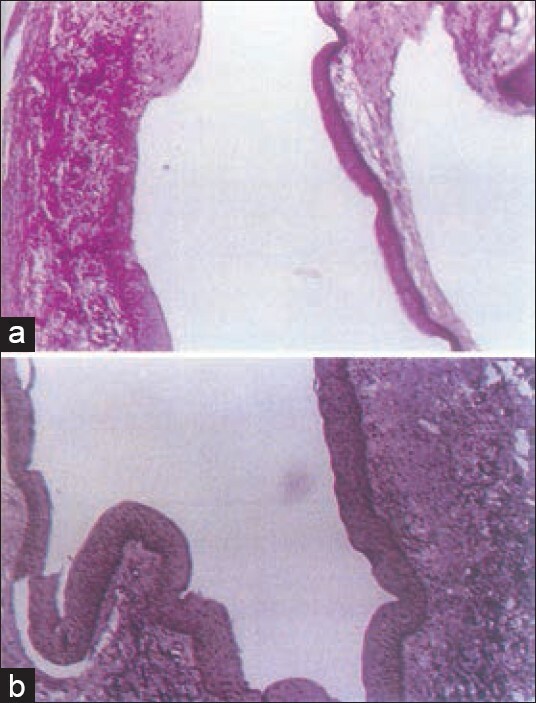 Three paraffin section of 4 μm were cut, one was used for routine hematoxylin and eosin stain, while the other two were used for immunohistochemistry. Statistical analysis was performed using Chi-square test. Results: The level of staining and intensity were assessed in all these cases. 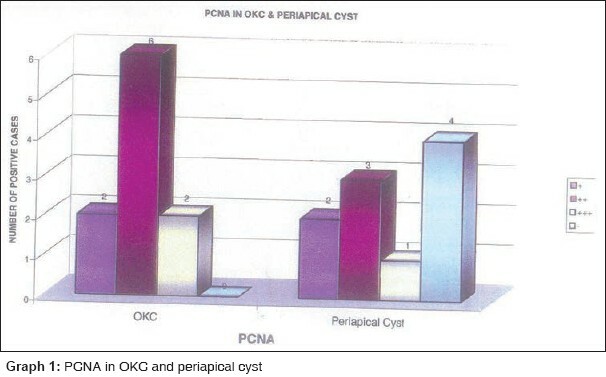 OKC showed PCNA expression in all cases (100%), whereas in perapical cyst only 60% of cases exhibited PCNA staining. (1) OKC showed p53 expression in 6 cases (60%) whereas in PA only 10% of the cases exhibited p53 staining. Chi-square test showed PCNA staining intensity was more significant than p53 in OKC. (2) The staining intensity of PA using p53, PCNA revealed that PCNA stating intensity was more significant than p53. Conclusion: OKC shows significant proliferative activity than PA using PCNA and p53. PCNA staining was more intense when compared with p53 in both OKC and PA.
Cystic lesions of the jaws are the most common conditions in oral pathology. These cysts, which arise from the oral ectoderm that gives rise to tooth formation, are called odontogenic cysts, in which odontogenic keratocyst (OKC) and periapical cyst (PA) are the most common types. Odontogenic keratocysts are developmental cysts, but radicular cysts are inflammatory in origin. Radicular cyst arises as sequelae of dental caries or associated with nonvital tooth. 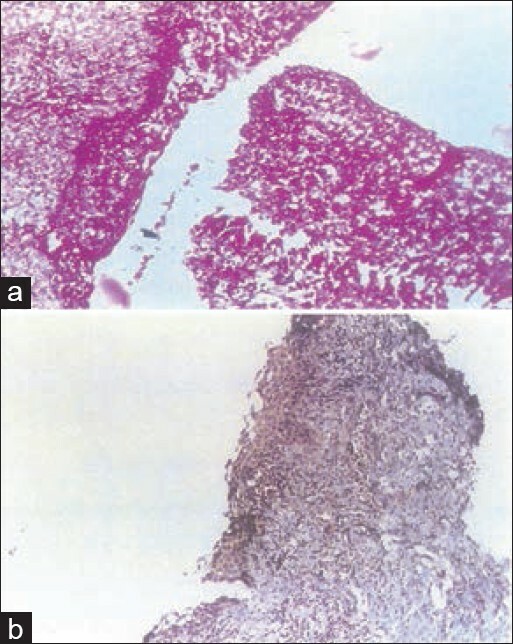 Histologically, most radicular cysts are lined by a nonkeratinizing stratified squamous epithelium and associated inflammatory cell infiltrate. The epithelial lining of OKCs appears to express intrinsic growth potential not present in other types of odontogenic cysts. Its high recurrence rate, close relation to the nevoid basal cell carcinoma syndrome and putative increased risk of neoplastic change in comparison to other odontogenic cysts places it in a unique position within the spectrum of odotogenic lesions. p53 protein was first reported by Lane and Crawford in 1979. It is a product of the p53 gene, which is now classified as a tumor suppressor gene. The gene is a frequent target for mutation, being seen as a common step in the pathogenesis of many human cancers. In normal cells p53 protein has a very short half-life, such that it cannot be detected immunohistochemically. Mutation of the p53 gene often results in increased stability of the gene product (p53 protein). Thus, the mutant form can be detected in the nucleus using immunohistochemical techniques, numerous studies report that it has been identified in malignant cells, but not in normal cells. Proliferating cell nuclear antigen (PCNA) is a 36 kd nuclear protein, the expression of which is correlated with the S-phase of cell cycle. To compare the expression of PCNA in lining epithelium of OKC and PA. The materials for this retrospective study were retrieved from the records (1993-2002) of the Department of Oral Pathology, Ragas Dental College and Hospital, Chennai. Twenty cases of odontogenic cysts were selected in which 10 were OKC and 10 were PA. Selection was based on review of previously reported slides in which epithelial lining was intact. The specimen of these cases, which were fixed in 10% neutral buffered formalin, was taken for the study. Three paraffin sections of 4 um were cut; one was used for routine hematoxylin and eosin stain, while the other two were used for immunohistochemistry. The slides with tissue sections were treated with two changes of xylene to remove paraffin wax. They were then put in descending grades of alcohol that helps in dehydration of the tissue. Slides were then washed in two changes of distilled water that helps in rehydration. Slides were then treated with 5% hydrogen peroxide for 20 min to quench endogenous peroxidase activity of cells that would otherwise result in nonspecific staining. The slides were then put in two changes of distilled water. Then the slides were transferred to citrate buffer and autoclaved for antigen retrieval at 15 lbs pressure for 15 min. The slides were then washed in two changes of distilled water. Then the slides were dipped in two changes of phosphate buffered saline (PBS) for 5 min each. The slides were then wiped carefully without touching the tissue section with gauze to remove excess PBS. Then primary antibody (DAKO-DO7) was added to P tissue on the slides and then to the N PBS and left in the fridge overnight while staining for p53 and while staining for PCNA the slides were flooded with PBS and left in fridge. Following day primary antibody PCNA was added on P tissue of slides while staining for PCNA and on the N section negative control was added and incubated for 45 min. Then the slides were washed in three changes of cold PBS for 5 min in each change. Then the slides were wiped carefully without touching the tissue section with gauze to remove excess PBS. Then, a drop of Biotnylated link from the secondary antibody kit (DAKO LSAB 2 KIT) was added on both the sections on the slides and slides were incubated for 20 min. Later slides were washed in 3 changes of cold PBS. Slides were carefully wiped without touching the tissue to remove excess PBS. Then a drop of Streptavidin (DAKO LSAB 2 KIT) was added on both the tissues on the slide and incubated for 20 min. The slides were then washed in three changes of cold PBS. Then a drop of freshly prepared 3'-diaminobenzidine (3'- DAB tetra hydrochloride - a substrate chromogen) was added on both sections. Slides were then washed in running distilled water to remove excess DAB and were counter stained with hematoxylin. Slides were then placed in a tray with tap water for bluing. The slides were transferred to 70% alcohol, 100% alcohol, and two changes of xylene in a sequential order. The tissue sections were mounted with DPX. Slides were then observed under microscope. Throughout the procedure care was taken not to dry the tissue. The slides were checked for positive staining on both tissue marked as P and N. If N has taken positive staining, then the slide was discarded and the sections were restrained. Level of cells that were positively stained (basal or suprabasal) was noted. 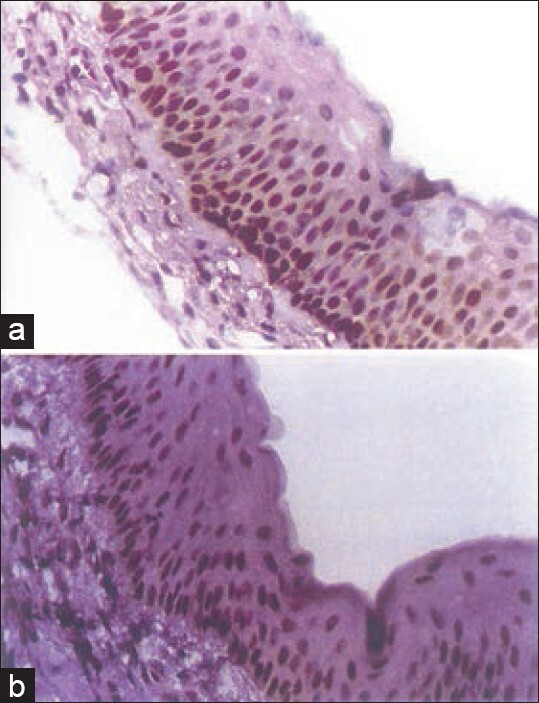 Intensity of staining (mild, moderate on intense staining) was noted and graded as +, ++ and +++ respectively. Mild staining denoting light brown color, moderate - brown color, and intense - dark brown color. The expression of PCNA and p53 protein was investigated in 10 cases of OKC and 10 cases of PA. PCNA and p53 immunoreactivity was observed in the nuclei of cells to varying extent. Staining intensity of PCNA and p53 varied from weak to strong, depending on the cells. Nuclei were considered positive when they appeared light brown or dark brown. The staining intensity in OKC and PA was graded for PCNA. 2 cases showed staining +++ (20%) [Table 1] and [Graph 1]. 4 cases showed negative staining (40%) [Table 1] and [Graph 1]. p53 in OKC and PA.
Six out of 10 cases of OKC showed positive staining for p53 and 4/10 cases showed negative staining. 4 cases showed negative staining (40%) [Table 2] and [Graph 2]. It was observed that only one out of 10 PA showed staining for p53 (10%). 9/10 PA showed negative staining (90%) [Table 2] and [Graph 2]. The expression of p53 and PCNA was seen in basal and predominantly in the supra basal layer of all cases of OKC and PA. The staining intensity of PA using PCNA and p53 revealed that PCNA staining was more significant than p53. OKC showed significant proliferative activity than PA using both PCNA and p53. Cell kinetics in the epithelial lining of odontogenic cysts have been reported using many methods, such as mitotic count, tritiated thymidine incorporation, tissue culture, and immunocytochemistry in cryostat section. Immunocytochemical methods of assessing cell proliferation have better advantages over other techniques because of maintenance of cellular and tissue architecture, the relative simplicity of methodology and rapidity of results. In addition, the feasibility of using paraffin embedded sections allows retrospective study of specified lesions within a short time framework. Based on this principle, the present retrospective study was designed to evaluate the proliferative cell kinetics of the epithelial lining of OKC and PA. Proliferating cell nuclear antigen is a 36 KD nuclear protein associated with the cell cycle, increases through G1, peaks at G1/S interface and decreases through G2 phase. It is generally considered to be a marker of cell replication. The p53 gene, encodes a nuclear phosphoprotein, which is thought to control cell growth at G1/S checkpoint. Wild type p53 can suppress or inhibit the transformation of cells in culture by viral or cellular oncogenes and arrest the cell cycle of a transformed cell at the G1 phase. On the contrary, mutant form of p53 shows dominant oncogene properties promoting cell proliferation and malignant transformation. Therefore, these two proliferative markers, namely p53 and PCNA were chosen to study the mechanism that regulates cell proliferation and to understand the mechanism underlying the pathogenesis of OKC or PAs. 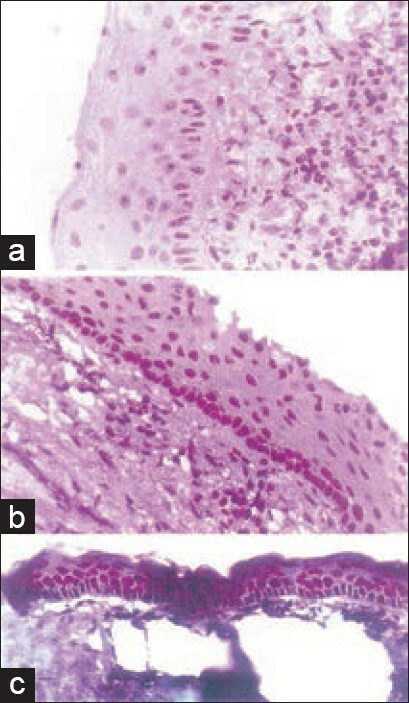 The present study showed, p53 and PCNA immunoreactivity in the nuclei of cells in basal and more predominantly in suprabasal layer of OKC and PA lining, with varying proportion and varied intensity [Figure 1], [Figure 2], [Figure 3], [Figure 4] and [Figure 5]. P53 and PCNA were increased in OKC compared with PA. P53 and PCNA showed 60% and 100% expression, respectively in OKC compared to 10% and 60% in PA. Similarly, the intensity of staining was more (++) in 60% of OKC, whereas it was only 30% in PA. These results are consistent with the findings of Li et al. and also consistent with other studies using mitotic counting, tritiated thymidine incorporation and K67 immunostaining methods. ,,, This suggests, greater proliferative activity in OKC thus explaining their more aggressive clinical behavior. Although, all the cases of OKC epithelial lining (100%) expressed positive staining pattern with PCNA, only 60% expression was noted with p53. In all cases suprabasal staining was more marked than in the basal cell layer. Histological  and histochemical studies  have suggested the possibilities of basal cells being more differentiated than supra basal cells. The columnar appearance of basal cell with apparent reverse polarity resembling preameloblasts, indicates that they might have entered to some extent the pathway toward ameloblast differentiation. In this study, the observation of more number of positive cells in the suprabasal layer of OKC confirms the views of Browne 1971,  Ogden et al. 1992  and Li 1996. Comparison of p53 and PCNA expression showed that PCNA showing more expressivity than p53. Immunocytochemical detection of p53 may be influenced by many technical valuables(Hall PA 1994),  such as alteration in deduction thresholds with different antibodies and different methods of antigen retrieval. , A number of studies have demonstrated a close correlation between increased p53 protein expression and mutation of the p53 gene. , However, recent studies indicate that cellular insult can be a potent inducer of wild type p53 protein, which can be stabilized and become immunocytochemically detectable. Wu et al. 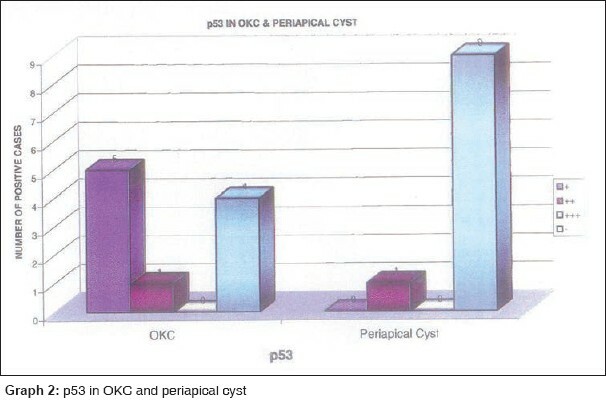 1993,  Li 1996  are of opinion that p53 over expression by OKC compared to other types of odontogenic cysts is not due to mutation of p53 gene, rather, over production and/or stabilization of normal p53 product appears to be related to proliferation. 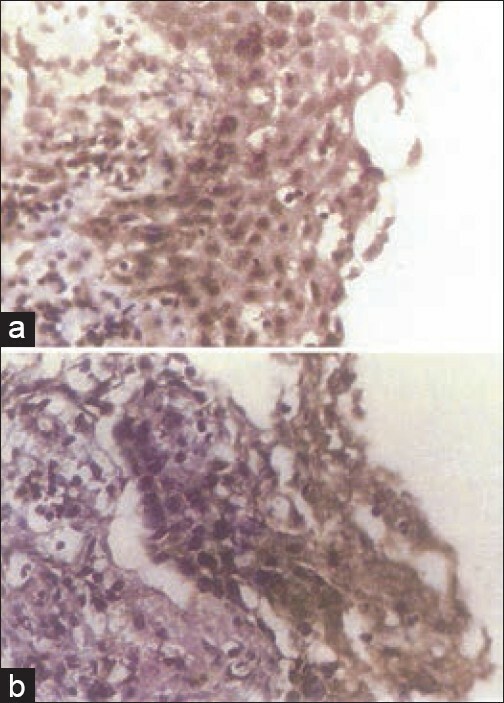 In OKCs, suprebasal cells showed more intense staining than basal cells with both antibodies. 1. Ogden GR, Chisholm DM, Kiddie RA, Lane DP. p53 protein in odontogenic cysts: Increased expression in some odontogenic keratocysts. J Clin Pathol 1992;45:1007-10. 2. Ogata K, Kurki P, Celis JE, Nakamura RM, Tan EM. Monoclonal antibodies to a nuclear protein (PCNA/cyclin) associated with DNA replication. Exp Cell Res 1987;168:475-86. 3. Garcia RL, Coltrera MD, Gown AM. Analysis of proliferative grade using anti-PCNA/cyclin monoclonal antibodies in fixed, embedded tissues. Comparison with flow cytometric analysis. Am J Pathol 1989;134:733-9. 4. Magnusson BC. Odontogenic keratocysts: A clinical and histological study with special reference to enzyme histochemistry. J Oral Pathol 1978;7:8-18. 5. Matthews JB, Mason GI, Browne RM. Epithelial cell markers and proliferating cells in odontogenic jaw cysts. J Pathol 1988;156:283-90. 6. Gao Z, Mackenzie IC, Cruchley AT, Williams DM, Leigh I, Lane EB. Cytokeratin expression of the odontogenic epithelia in dental follicles and developmental cysts. J Oral Pathol Med 1989;18:63-7. 7. Li TJ, Browne RM, Matthews JB. Quantification of PCNA+cells within odontogenic jaw cyst epithelium. J Oral Pathol Med 1994;23:184-9. 8. Main DM. The enlargement of epithelial jaw cysts. Odontol Revy 1970;21:29-49. 9. Browne RM. The odontogenic keratocyst. Histological features and their correlation with clinical behaviour. Br Dent J 1971;131:249-59. 10. Toller PA. Autoradiography of explants from odontogenic cysts. Br Dent J 1971;131:57-61. 11. Li TJ, Browne RM, Prime SS, Paterson IC, Matthews JB. p53 expression in odontogenic keratocyst epithelium. J Oral Pathol Med 1996;25:249-55. 13. Li TJ Browne RM11, Prime SS, Paterson JC, Mathews JB. Antigen retrieval by microwave irradiation lowers immunohistological detection thresholds. Histopathology 1993;23:377-9. 14. Lambkin HA, Mothersill CM, Kelehan P. Variations in immunohistochemical detection of p53 protein overexpression in cervical carcinomas with different antibodies and methods of detection. J Pathol 1994;172:13-8. 15. Iggo R, Gatter K, Bartek J, Lane D, Harris AL. Increased expression of mutant forms of p53 oncogene in primary lung cancer. Lancet 1990;335:675-9. 16. Baas IO, Mulder JW, Offerhaus GJ, Vogelstein B, Hamilton SR. An evaluation of six antibodies for immunohistochemistry of mutant p53 gene product in archival colorectal neoplasms. J Pathol 1994;172:5-12. 17. Wu X, Bayle JH, Olson D, Levine AJ. The p53-mdm-2 autoregulatory feedback loop. Genes Dev 1993;7:1126-32.